I love the 2nd Monday of the month when it is once again it is time for the Secret Recipe Club reveal. So fun to go through other food blogs and find a recipe to try. Even more exciting is to see what others thought was an interesting recipe to try off my blog. Essentially it is like secret santa just with recipes! 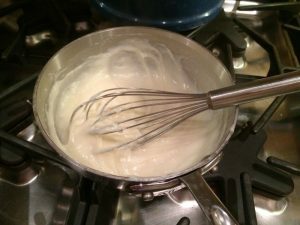 For those of you new to this club concept, each month each blogger is assigned another blog and secretly find a recipe post that we would like to try, finally to reveal our experience with their recipe. This month’s assignment was CMOMCook. Shelly is the owner of the blog and loves to cook and share recipes that her family enjoys. This is the second time I was assigned Shelly’s Blog, you can see her yummy crock pot rotissere chicken recipe from last time. Be sure and check out her blog for family friendly and easy weeknight dinners. 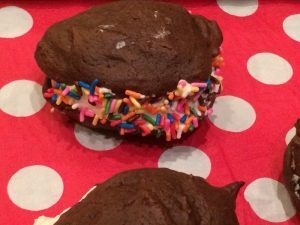 In celebration of Valentine’s Day desserts I decided to try making Shelly’s Whoopie Pies Recipe. I have never made these before and I really have never tasted one that I can remember. This was definitely a challenge for me. I was leaving for the weekend with my youngest so I also wanted to leave them with a tasty memory. Just like any other cake mix really. 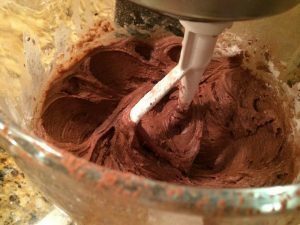 I have seen a few recipes where they use a boxed cake mix. NO whoopie pie pan needed. SOme people actually trace circles under parchment paper to get exact shapes. They look pretty good right out of the oven. 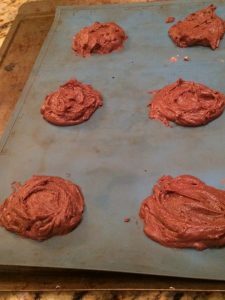 I thought I would try the traditional whoopie pie filling since we do not have food allergies, this took a bit of work, especially when our dog ate the first set of rue we had out to cool. Now the fun begins with filling our whoopie pies. I think they look amazing. This was more than enough filling for our cake recipe. Fluffy goodness I think….. well not much taste. Should have tried Shelly’s cookie dough recipe instead. I decided to add some sprinkles to see if this was more appealing for the kids. Based on these smiles I don’t think they were that bad. I have never had a whoopie pie but guessing they are a little sweeter in the filling. What a fun idea! Love the secret recipe club concept. 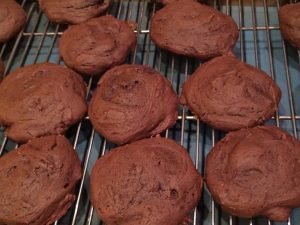 Your whoopie pies turned out great! Now I’m off to check out all the other amazing recipes. These look fun! Like little cakes with cream. Yummy! 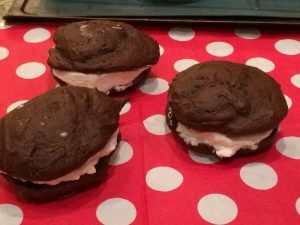 Whoopie Pies? never tasted one, but these look quite tempting, especially with the rainbow of sprinkles decorating the edges. Those look scrumptious. 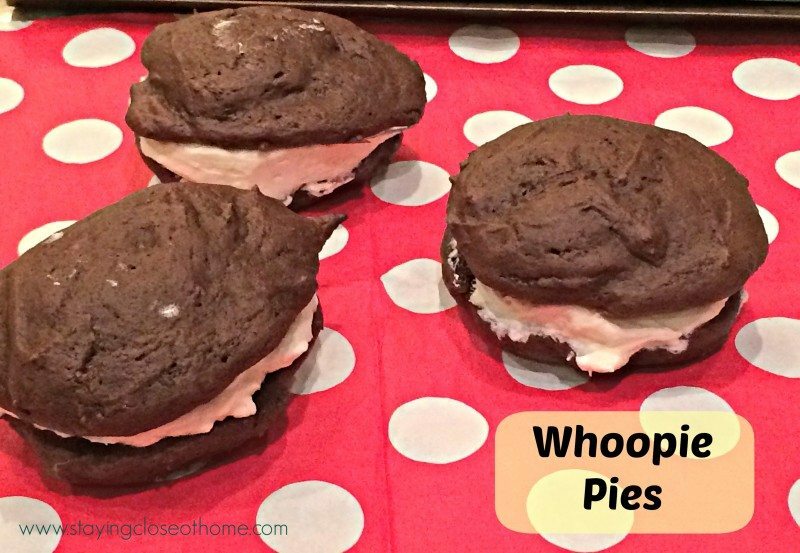 I have never liked the traditional whoopie pies but I may have to try these. Whoopie pies are such fun! I have never had a whoopie pie. I was always turned off by having to have a special pan. I love that your recipe doesn’t use one! Thanks for sharing with the SRC. Can’t wait to hear the history of the pies. 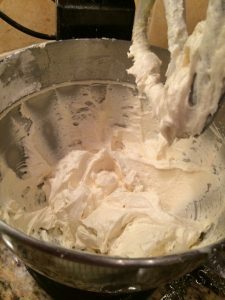 I love making whoopie pies. I haven’t made any in a while. THink I might pull out the recipe book and make a batch this week. I’ve made Whoopies Pies once! They’re so fun! Great SRC choice. I’d be very tempted to eat the batter – it looked so good! that is so interesting, thanks I will have to research the background of Whoopie pies. These look great and it looks like the kids loved them. I live near Shelley and whoopie pies are part of the history of this area. I love them and usually make pumpkin ones. Great choice for SRC! It looks like the kids have no complaints – they look fantastic!